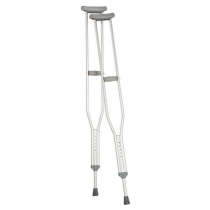 Walking Crutches, and also referred to as Underarm Crutches or broken leg crutches, are the standard aluminum adjustable crutches most frequently used. 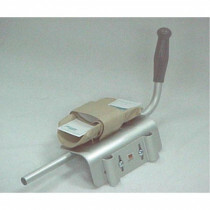 Distributing body weight on pads under the armpit, adjustable aluminum walking crutches allow independent mobility even after surgery and injury. 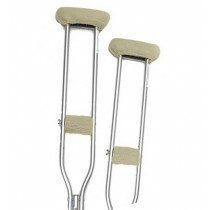 By removing weight from a single leg, underarm walking crutches provide stability to continue walking. 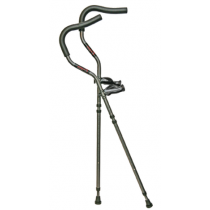 Walking and Underarm Crutches offer an easy and simple way to adjust the height of the handle or the length of the crutch to ensure you can set the height of the crutch to fit your body perfectly for comfort and stability. 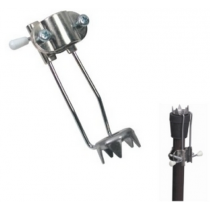 If you are looking for underarm crutches for broken leg, the Millennial Medical In-Motion Pro Crutch features an ergonomic underarm cradle shaped like a shepherds crook for increased stability and weight distribution while moving. Or try the Drive Medical Aluminum Walking Crutches for excellent padding, durable aluminum build and lightweight portability. 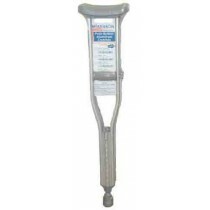 Vitality Medical offers walking underarm crutches for adults, adolescence and children (kids). 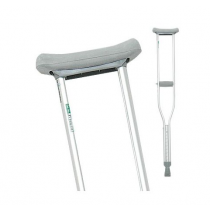 Types of axillary crutches include underarm crutches, standard crutches and folding crutches of both styles. Find the padding and appropriate traction to meet your mobility needs. Hey, everybody. It’s Doctor Jo. Today, I'm going to show you how to use some crutches. I had hip surgery recently so I've had the pleasure of hobbling around on crutches for several weeks now and sometimes they're a little harder than you think they are. But let me start off with showing you how to get the right height for you. When you first get your crutches, the buttons here, which you cannot see because they’ve got some cool Gamecocks over them, actually have height. So it starts off, 5’3, 5’4, 5’5, 5’6 and that's pretty accurate. But what you really want to do, the important part, is these should not actually be in your armpit. I think people get confused with that a little bit. Now sometimes you can lean on them if you're talking to somebody. But while you're actually walking with the axillary crutches, you don't want them pressing there because you have an axillary nerve that actually can get compressed. If you put a lot of pressure on for along period of time then you're going to have arm issues after that. You want to be able to get about two fingers in between the top of the axillary crunch in your armpit. When you're standing, if you can do that, that's about where you want it. You want to have just a slight bend in your elbows as well because you can move the handles. But it doesn't have to be a big bend, just a slight bend because when you're walking with the crutches, you don't want them super close. You want them out to the side just a little bit because that's going to give you some more stability while you're walking. Once you have all that in place, you get to the walking part. 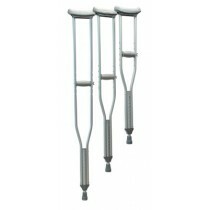 There are different types of weight bearing for people when they're doing crutches. You’re non-weight bearing, you can be toe-touch weight bearing, which is about 20% of your body weight. You can be partial weight bearing and then weight bearing as tolerated where it's just helping give you a little bit of balance. The first one I'm going to show you is non-weight bearing and then we'll progress from there. The first one is non-weight bearing. 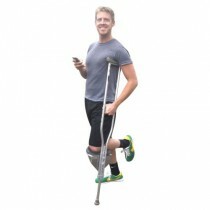 If you're not allowed to put any weight on your leg if you're kind of holding it up in the air, the crutches are going to take the place of your right leg. 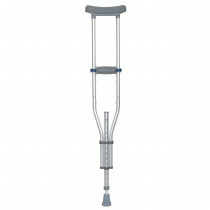 If my right leg was going to go forward, that's when my crutches go forward. You just bring them forward and hop through. You want to make sure you're not going far because you're going to lose your balance. So it's just almost like a normal step when you go through. You can also see my crutches are a little bit wider than my body because that gives you more stability. You don't want them close. You want them out just a little bit, again to give you that support and balance. The next one would be a toe-touch weight bearing which, depending on your surgery,is either really just your toes are touching down or your foot is actually flat on the ground. But toe touch is about 20% of your body weight. Some people will tell you imagine that there's egg shells underneath your foot, you don't want to crush them. So you're really just placing your foot down. But again, the crutches are taking on all the weight. So the crutches are going to follow that foot the whole time and take the place of actually putting the weight on that leg. 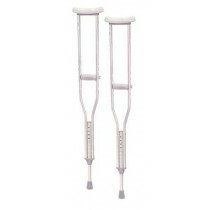 When my right leg goes forward, the crutches go forward. And I'm really just placing that foot down. I'm not really putting any weight on it but I'm just placing it gently on the ground, again, not taking a big step, just trying to take a normal step while you're walking. 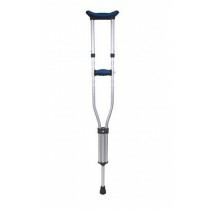 After you progress a little bit and you don't need to do the toe touch anymore and your partial weight bearing or maybe weight bearing as tolerated but you still need a little bit of assistance,then you can go down to one crutch. When you go down to the one crutch, you want to put it on the opposite side. It's going to follow the right side wherever it goes like a cane. It’s there to give you that support. As my right goes forward, the crutch goes forward. And I'm just stepping through, not leaning over onto the crutch. You're not leaning and just walking like this. You're still trying to be pretty upright and that crutch is just giving you a little bit of support, getting closer to being able to walk without anything. There you have it. That's how to walk with some crutches. If you have any questions, leave them in the comment section. If you'd like to check out some other videos, go to askdoctorjo.com. If you like the video, click the like button. And remember, be safe. Have fun.